3. Immigration to “Paradise found or lost”? The first part of the title of this paper is borrowed from a review by Andrew Riemer of David Malouf’s novel The Conversations at Curlow Creek which appeared in the Sydney Morning Herald shortly before the novel itself was published in 1996. In a laconic and humorous way it puts the synopsis of the novel into a nutshell, the ‘hanging’ being both a literal one as well as a metaphorical one. David Malouf’s eighth and latest novel to-date, The Conversations at Curlow Creek, again deals with the protagonists’ displacement from his home country and straying into the unknown. Similar to two of Malouf’s previous novels, Johnno ( 1975) and The Great World (1990), the main characters are involved in forced or willing voyages from their home country into an unfamiliar environment. Another thread that was already started by Malouf in An Imaginary Life (1978) is continued: feelings of exile beyond the edge of civilisation, life between two worlds. 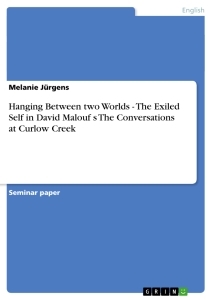 The exploration of psychological feelings of exile is a recurrent motif in the works of Malouf and in the Conversations for the first time it is exile from Ireland that is picked out as the main topic. To sum up the novel in brief: The year is 1827; Michael Adair, an Irish officer in the British army, comes to Curlow Creek, New South Wales, Australia, to supervise the execution of Daniel Carney, an Irish convict-turned-revolutionary. Carney roamed the area with a group of bushrangers under the leadership of a man called Dolan who was killed by troopers. Adair and Carney converse throughout the night, with Adair’s secret ambition being to find out if Dolan was actually his long lost stepbrother Fergus Connellan who is said to have been seen in New South Wales. The driving force behind finding Fergus is Adair’s love for Virgilia, the daughter of the neighbouring landowner back in Ireland, who is in love with Fergus and wants to find out what became of him. One day, Fergus just left Ireland and had not been seen since. According to rumours he is said to have started an Irish rebellion in Australia. In the end, Carney most likely manages to escape –the ending of the novel remains to a certain extent open, clues are nevertheless given- while it is hinted at that Adair has permitted his charge to escape. The Conversations explores the threatening conditions of the beginning of white settlement in Australia as well the gulf between the two worlds- Australia and Ireland- which seems hard or almost impossible to bridge. Life in the new colony was always connected with anguish of the present and future and agonizing memories of the past which are marvellously illuminated by the main character Adair. In the Conversations the main narrative does not concentrate on the protagonist Michael Adair’s actual journeys between Ireland and the new colony of Australia but on his mental journeys back to Ireland. More important than the exploration of structures of society in Australia and Ireland is the exploration of consciousness of the two main characters. The conversations between the officer Adair and the convict Carney reach the core of the Australian experience. On top of that, the images of exile and displacement are the most striking features of the novel. The main focus of the following paper will lie on the mental consequences of being in exile, mainly portrayed in the protagonist – or main consciousness- Michael Adair. Furthermore I will propose to consider the notions of estrangement that can be found in Adair as well as in Carney, the differences between life in their home country Ireland and their new (temporary) home Australia from the colonial point of view. Irish settlement in Australia started off with the transportation of Irish convicts by the British Crown to Australia in 1780. By 1803 there were 2086 Irish convicts in Australia, 40% were political prisoners and the remainder were sentenced for criminal offences. By 1836 there were about 20,000 Irish in the country and in 1861, three years after the transportation had ended, the Irish community constituted almost 20% of the population of Australia. The biggest spur to emigration from Ireland came in 1827, the year the Conversations is set in, when the government repealed all restrictions on emigration. Apart from being a convict colony, the new founded colony is envisioned by the Irish as well as the English settlers as a chance to start a new life, to make a living on their own and eventually to prosper. But the prospects of a better life were often quickly undermined by the harsh reality the settlers were confronted with. The differences to their home country, dry landscape, vast remoteness etc. were often difficult to manage. The Conversations is both based on historical facts as well as old legends. Malouf’s story is an adaptation of an archetypal Romantic story. The character of Dolan is not a literary invention by David Malouf; it is based on the historical figure of John Donohue, an Irish rebel and one of the most famous Australian bushrangers on a par with Ned Kelly after him. Dolan –as the legendary leader of Carney’s gang of bushrangers in the Conversations is called- is one of the names Donohue was known by. Donohue was born in Ireland in about 1806. He was transported under a life sentence of 'Intent to commit a felony', and arrived in Sydney on January 2nd, 1828, aboard the ship 'Ann & Amelia'. It was not long before he took off with two men named Smith and Kilroy, and after robbing several bullock drays on the Sydney to Windsor road he was captured and sentenced to death. While being escorted from the court to Sussex Street Gaol, Donohue escaped but not so his companions who were hanged. Donohue teamed up with several others including William Underwood and together they plundered near and far. At the time, John Donohue was on the front of every newspaper in Australia. The legend of 'Bold Jack Donohue' is more like that of an antipodean Robin Hood, a bold, handsome man who robbed the rich and shared his prey with the poor farmers from the outback. He had soon become the hero of oppressed convict gangs and small settlers alike. Some reports stated that he tormented his victims and may have burnt one squatter alive. Initially a reward of £20 was offered for his capture, but this was extended to an offer of 'An Absolute Pardon and Free Passage to England, or a grant of land', and still no arrest followed. Eventually however, the police finally caught up with Donohue near Campbelltown on September 1st, 1830, when he and the gang were surrounded by a detachment of soldiers. Donohue was shot through the head after a manhunt of 2 ½ years. But the legend of 'Bold Jack Donohue' lived on in a song until it was banned by the authorities. Not to be beaten, however, it continued on with the named changed to 'Jack Doolan' and finally 'The Wild Colonial Boy', a popular 19th-century ballad which is the most famous manifestation of the old legend. The tune originated in Ireland and immigrated to Australia. The villain is alternately called Jack Donohue or Jack Doogan. Nowadays the tune is a very popular and famous song in Australia, a campfire sing-along, with the lyrics slightly alternating in the different versions. The tune can be listened to on the internet at http://www.crixa.com/muse/songnet/097.html. In the Conversations Malouf presents us his personal version of a bushranger story with the much more popular ending of the convict possibly getting away from his death sentence with the help of the supervising officer. The new founded colony offered almost unlimited space, land taken from the Aboriginal peoples, land that no white man had ever set foot on. Yet the country was in a lot of ways very different from the surroundings the settlers were used to from home, ranging from the natural vastness to the cultural remoteness of the land. The settlers were strangers to this new place in every aspect. The factors of this strangeness included the threatening landscape, the Aboriginal peoples and their languages and customs. Robert B. Zajonc- quoted in Heinke’s essay To Annihilate the Self With Distance- defined being a stranger as follows: “By a ‘stranger’ we understand a visitor to a country, which becomes his temporary domicile, but which was not the locus of his socialisation.” In Adair’s case the locus of socialisation was Ireland, the place where he associated with people and where he fell in love; thus the locus of his most intimate relations so far. In Malouf’s definition of ‘home’ as well as in Zajonc’s definition of the ‘stranger’ it becomes apparent that it is the people around you, the social surroundings more than anything that are responsible for a feeling of comfort, contentment and security. Even though parts of the Conversations have their origin in historical facts and legends, it cannot be called a historical novel. Malouf picked out the beginnings of white settlement in New South Wales as a central theme, but historical facts remain indistinct. The place, Curlow Creek, remains abstract while the year is identified as 1827, the time of early settlement. Only in a few notions at the side- for example when Adair tries to make Carney betray his former leader Dolan- Malouf refers to historical events that have actually taken place in Australia such as the Castle Hill Rebellion (cf. p.110), the first rebellion in Australian history. The names McBride and Lonergan – possible gang members who might have taken part in the rebellion- however, are not to be found in connection with the Castle Hill Rebellion and thus might just be a literary invention by Malouf. In the Conversations Malouf depicts life how it could have been in 19th- century New South Wales with its immeasurable inaccessibility and “sparse amenities” (p. 195) but also its ascetic beauty and contrasts it with the verdant landscape of Ireland. As Adair and Carney converse throughout the night and reminisce about their past in Ireland, a quite detailed overall picture of Ireland in the beginning of the 19th century is gradually painted. The two main social classes are portrayed in the two men: Adair was adopted when he was four by a close friend of his mother – Mama Aimée- into a rich family of the Irish gentry after his parents- both opera singers- had drowned in the sea. Education and opportunity of all kind was accessible to him, while Carney’s life in Ireland was the complete contrast of Adair’s. But even though Adair grew up among the upper class and thus had opportunities for the future that Carney could only dream of, he did not feel part of the gentry. His position in the upper class and society in general had always been an ambiguous one. Not having a secure place in society makes Adair lead a conventional life in accordance with restraint, order and reason as will be examined at a later stage in the paper. After having travelled through Europe for a few years, Adair eventually arrives in Australia voluntarily to look for his love-rival foster brother Fergus. By finding proof of Fergus’ death, Adair might win Virgilia over. Virgilia is in love with Fergus – who does not love her in return - but does not know his whereabouts, so if she heard of his possible death, the cards might be reshuffled and Adair might obtain her love. What might look like free will at first sight is interpreted differently by Adair himself. Earlier in the novel, Adair is characterized as someone who does not like to travel to other countries and yet his ventures bring him to a lot of places in the world. He sees his reasons for coming to Australia “[not] as a punishment but in ways that were equally inescapable.” (p.58) Nevertheless, due to the cruel austerity of the country, Adair had often wanted to give up the difficult endeavour of finding Fergus. Fergus’ concern had always been for the simple and poor people- a character trait that according to rumours he supposedly continued in Australia by roaming the outback as a Robin Hood-of-the-bush. Shortly before Adair is due to leave Ellersley, Fergus takes him and Virgilia out to the O’Riordan–family, a family that Fergus had been visiting and giving goods for a while. It is this newly discovered side of Fergus’ personality - reflected upon from a different angle now at the other side of the world – that can be seen as the impetus for Adair’s altered perception of the world that will be discussed in more detail in chapter 7 (Arriving at a new self). In the following text The Conversations at Curlow Creek will only be referred to as the Conversations. The page numbers of the quotations in the following text correspond with the following edition of the novel: David Malouf: The Conversations at Curlow Creek, New York, 1997. On March 4th, 1804, soldiers were called in to crush an uprising of 300 Irish convicts at Castle Hill to the north of Parramatta in New South Wales. Fifteen Irishmen were killed and the leaders were hung. The rest of the convicts were moved to Newcastle and became the first inhabitants of a New South Wales secondary punishment establishment. David Malouf in an interview with Helen Daniel: http://www.lib.latrobe.edu.au/AHR/archive/Issue-Sept-1996/intermal.html. Treatment of Class in "A Fringe of Leaves" and "The Conversations at Curlow Creek"
Boundaries in David Malouf's "Remembering Babylon"
Dissolved Frontiers: Encountering the Other and the deconstruction of a binary world model in David Lodge's "Nice Work"
Mary Queen of Scots Got Her Head Chopped Off - A Text for a Postcolonial Studies Curriculum?